A few days ago I finished the final hexagon on my crazyass hexagon socks. I stood up, did a little dance, and then proceeded to start…the…toe? In my hurry to get the final row of hexagons done, I had not paid close enough attention to which end of the sock I had done that last row on. Four hexagons that were supposed to be working toward the toe. Four hexagons that were, instead, on the cuff. It looked like a knee sock for an eight-year-old. I wish that it had been as simple as surgically removing the hexagons and just stitching them onto the other end, but then again things can never really be that simple, can they? I had to rip out all four hexagons individually and restart that row from scratch. 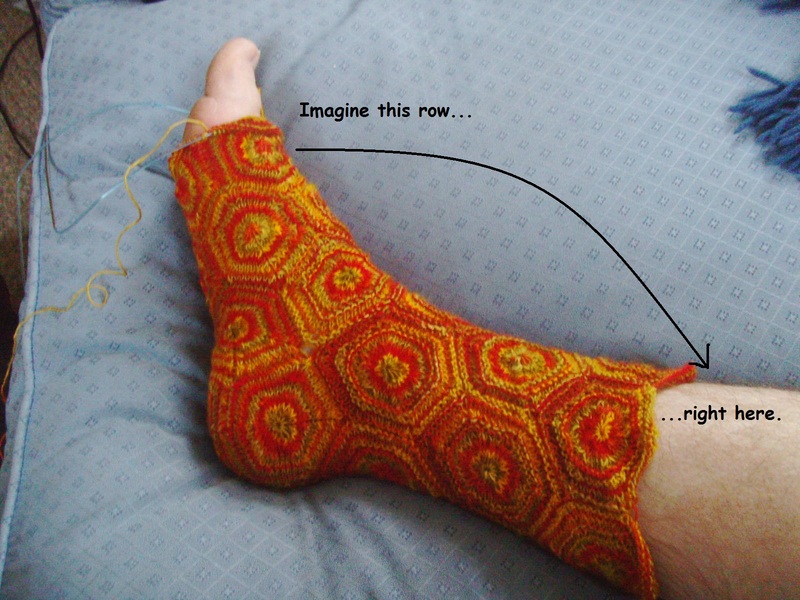 After a couple of days’ break from the accursed thing, I am happy to report that I have gotten past the frustration (somewhat), have completed the final four hexagons ON THE CORRECT END OF THE SOCK and am working on picking up the toe stitches. I am so ready to move on….